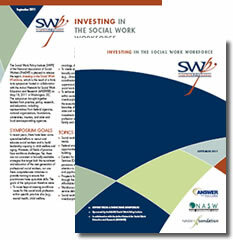 Investing in the Social Work Workforce, a new report and action brief from a May 2011 think tank symposium is now available from the Social Work Policy Institute of the National Association of Social Workers Foundation. The report explores the need for more comprehensive, broadly available strategies that target both the recruitment and education of the next generation of professional social workers, and the training of current practitioners. The goals are to ensure that social workers have up-to-date skills and the necessary knowledge to meet the demands of the individuals, families, organizations and communities in need. The action agenda (see below) highlights the need for the profession to work across social work organizations and with interdisciplinary partners and to engage the executive and legislative branches of government and foundations at both the state and national levels, in order to enhance investments in social work across all fields of practice. Targets for action include influencing social work education, expanding use of data and research, influencing service delivery, and strengthening policy and practice linkages. (Cheri Latimer, Case Management Society of America). This report is the 4th major report released by the Social Work Policy Institute. For more information view the Publications, Research and News/Events on the Social Work Policy Institute website, www.socialworkpolicy.org.